Acting United States Attorney for the Southern District of New York Joon H. Kim speaks during a press conference to announce charges of fraud and corruption in college basketball, Sept. 26, 2017, in New York City. 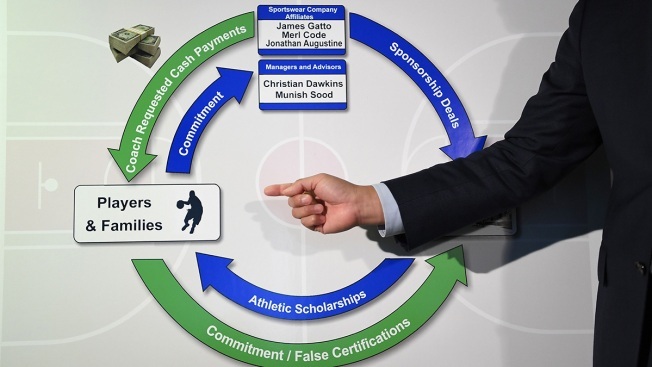 Two more college basketball corruption trials are set for next year. The defendants include Chuck Person, a former associate head coach at Auburn who played for five NBA teams over 13 seasons, and also former assistant coaches Tony Bland of USC, Emanuel Richardson of Arizona and Lamont Evans of Oklahoma State. In closing arguments at the first trial, prosecutor Noah Solowiejczyk recounted testimony from cooperators and wiretap evidence about how the defendants took steps to create false invoices to Adidas, route funds through various bank accounts and convert it to cash for the families. Defense attorneys sought to convince the jury the text messages and phone records showing Self and Pitino were in touch with the recruitment middlemen aligned with Adidas proved they had to be aware of the payments. They said further proof the schools weren't blind to the schemes was testimony by Brian Bowen Sr. claiming he received $1,300 from Louisville assistant Kenny Johnson and other testimony by a cooperator, former Adidas consultant, Thomas "T.J." Gassnola, that he delivered $40,000 to North Carolina State assistant coach Orlando Early intended for the family of highly-touted point guard Dennis Smith Jr. In the texts last year, Gassnola told Self he was in the touch with the guardian of player Silvio De Sousa, who prosecutors say was among recruits whose families were offered secret payments. And another exhibit showed how Dawkins was communicating with Pitino as Bowen was nearing a decision about where he would play. Self remains at Kansas. But the school announced this week that De Sousa will be benched during games by the top-ranked Jayhawks pending a review of his eligibility. In a statement on Wednesday, Kansas school officials said they were working with federal authorities and the NCAA to ensure "a culture of compliance." They also said they are continuing to evaluate their options about whether to extend a contract with Adidas. At Louisville, the scandal resulted in the firing of Pitino — who had been hurt by previous controversies — and forced Bowen to leave the university and college basketball entirely without ever playing a game. Pitino has denied any wrongdoing. Bowen is pursuing a professional career in Australia.